"Here's a short review for you, but that doesn't mean the movie's not worth watching." "There's no big, amazing scenes of spectacular horror or action, it's just a story of a very disturbed, cold man who hates women and kills them instead of doing it to his mother. The direction is workman-like, nothing out of the ordinary, which also brings more power and energy to the script itself and especially the brilliant performance by Victor Buono. I mean, he looks like a doll - absolutely charming, a smooth and peaceful face and a lush persona - but here he's so mean and cold, calculating. This casting is brilliant." Yeah, there are a couple of those films that I´ve seen...like Felicia's Journey (1999), 10 Rillington Place (1971), Henry: Portrait of a Serial Killer (1986) etc. These kinds of serial killer films can be very entertaining, and don´t need big budgets, big stars etc. 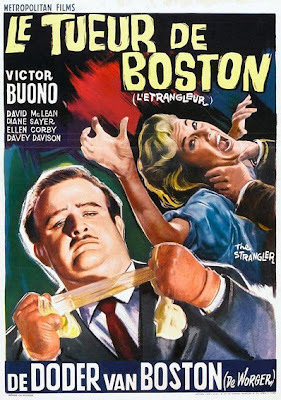 "The black & white photo is very atmospheric and even if it's way smaller and cheaper then The Boston Strangler (starring Tony Curtis) and No Way To Treat A Lady, these would be a very interesting triple feature." You could say that again....thanks ninja.